Let us assume that you are company owner where item number production is 150, 000. Here we will consider that price f individual unit is $100. Currently, rates of your individual commodities as per retail price were $500. However, you are expecting the price of those units to go up in the retail market by another $100. In case the expectation comes to be true, then the amount will be $600. If there is a drop of $100, then the new value will be $400 for per unit. In the upcoming year, the expected price for per unit by you can be 200. With the help of a tree, this calculation is highlighted. If any of the prices change, the altercations will be similar. 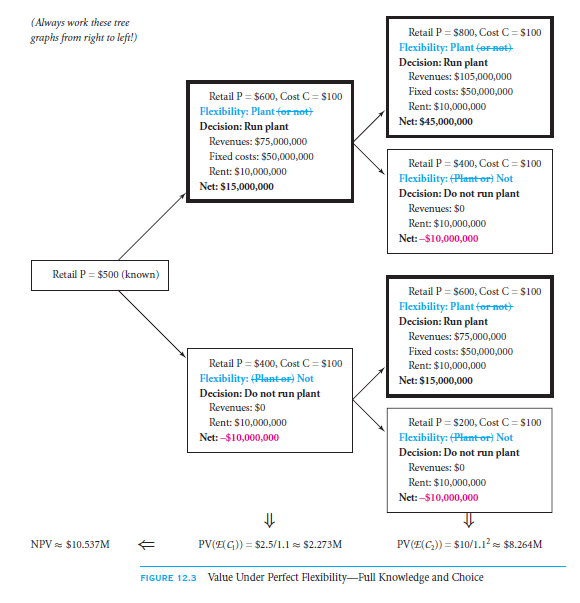 In this case, fixed cost related to your plant is $50 million. Even if you are not running the company, the minimum amount that you will get from your plant is $10 million. As we have already considered this world to be risk neutral, the rate of interest in yearly basis will be 10%. This rate will be applicable in the upcoming year when it is related to cash flow. Let us consider the fact that you are already aware of the price at the initial point of the year. This will help you understand and analyse over all amount of a complete year. This is because of the phase of time when consumer orders do come. The concept states the fact that this is an arduous job. However, its taxing effect can be seen only when you experience it. Going through this example,we will try to understand about in a better way with the help of the same project. Its valuation will be analysed with the assistance of many situations which will give a number of evaluations and speculations. You will also come to know of its correct response when considered with prevailing environment. The foremost thing that needs to be computed is a value when under inflexible behaviour. As per the heading, this criterion is an extreme benchmark. How would you calculate the value as per current situation is the operation is related to the present or of future? Now, in this case, the answer looks simple. However, it is not. If you want to run the company or not, your decision will ensure that the unit value will be either $400 or $600. On the basis of this, we can see scenarios. The value of your company will be zero if you decide not to run it. In the very beginning, you can see the calculating tree. In case you wish to run your plant, essential decisions will be required to be made depending on that tree. This will make you entire work easier. In case there is a hike in the unit value when you are running your plant,i.e., $600, the amount earned by you will be $15 million. Computation for this is simple. As expected revenue from your side is zero, so in the upcoming years, the valuation in series will be +$45 million, −$15 million. Or again it may be in the form of +$15 million or −$45 million. 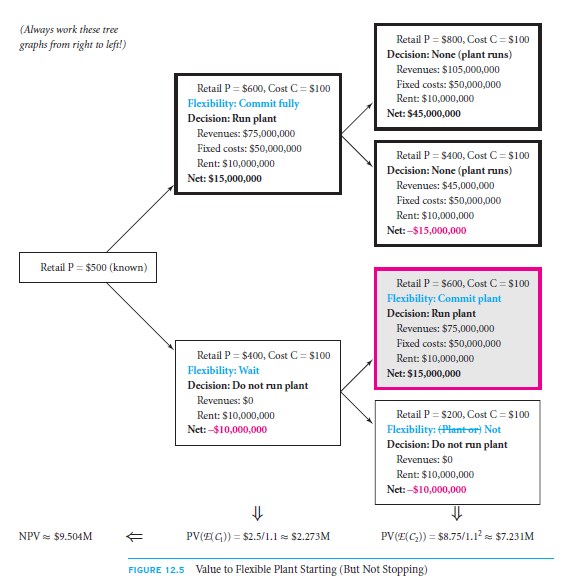 If you follow the calculation tree, them the value of zero is also an important component when it comes to calculating the expected outcome. Without any gain or loss, $500 is the expected value of individual products in future.In case there is a surge in value, making the price to be $600, expected revenue that will be translated into its production cost would be $60 million. Nevertheless, you need to keep that in mind that payment for fixed cost and rent is separate. When you are working with expected value, you will find it similar to be working ina scenario where you cannot take any strategic decisions or go for any choices related to future benefit. In this case, the speculation is related to the reverse benchmark for that which was considered in the previous case.You are already aware of the total estimation of your plant and have the flexibility in operation of it. You may continue running your plant, or you may close it. The choice is entirely dependent on you. This entire option can be stated as timing options. If on the resultant, you deduct the sunken value of $10 million, revenue that will be left here will be $15 million. You rearning for $400 per unit will be $45 million. Although this is not a huge amount, still it will not cover your companies fixed operating costs which are $50 million. In this scenario, one of the best options would be rent payment of $10 million and stop the plant operation process. Flexibility in action and knowledge how to use the details are 2 most important factors that can help change the condition of a company. It is basically an idea which when used wisely can hike the profitability of that company. 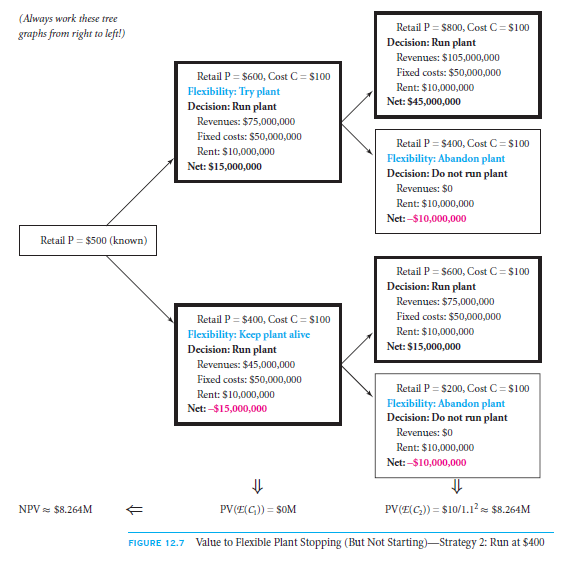 This strategic opinion can help you get the value of+$10.5 million. There are certain instances where you are left with real options in place of flexibility. How can you describethe option if you are bound to declare you option after a complete year? To simplify the question, if price appreciation for per unit is $600 when you have to run you company, what will be the value if the depreciation value is $400? Suppose you make your mind to run your company in the upcoming year. In this scenario, once you start with the operation, you will have to continue with the process until the year comes to an end.Again, if you don’t operate in the upcoming year, then in the following year too, you cannot run the plant. If you take a closer look at this diagram or tree, you can see an alternate ‘circumstance that allows you with the flexibility of starting a plant. 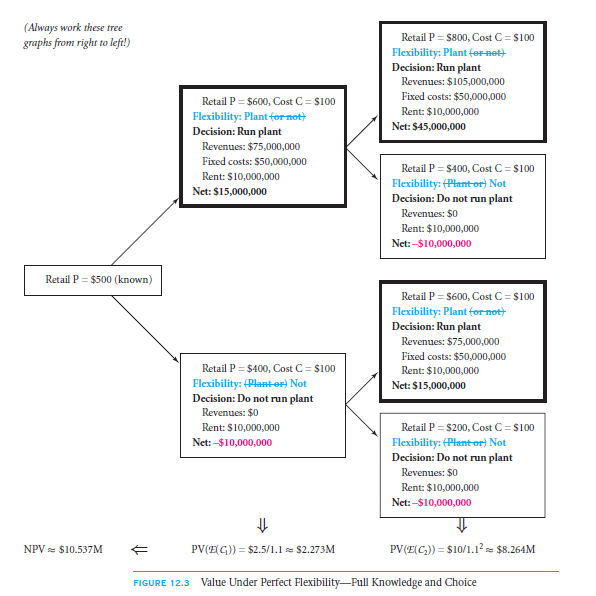 As per this figure, value of this plant at present is +$9.5 million. You can clearly see 1 node from where it becomes easier to earn money. This is the same place before the piece hit where you promised not to involve in any operation nor run it. But because of the flexibility in the least leave, you do not have the option in the final period to shut down your company if there is a decline in the rate of unit ($400). With this, I will explain you about a different situation where you can continue to keep your company at a stop even after you have closed it. In a simplified version, it means that you, yourself will not have any flexibility to restart your plant. Where you instruct your company workers to leave and shut down the burners, this process can also be stated to be abandonment option. If you try to solve the issues on the basis of this calculation tree diagram, you will find the process extremely difficult. This is due to the fact that optimal strategy is independent of the stratagems of the present year and relies on the upcoming years. If you closely look at the instance that is highlighted before this, you will find it quite simple. Well, I made sure that the complications are removed for you so that the entire concept is crystal clear. The motive to do so is mainly showing you the optimal strategies so that you can understand the importance of possible future scenarios and the present firm conditions. Also, you on seeing this can comprehend the relationship and dependency of both on each other. If you go through real option’s we chapters, explanation of such issues can be found with examples, that too in a systematic way. We will discuss the fact how some decisions can work forwards and some backwards. Another of the important tools that you can see in this chapter is aforementioned scenario analysis. Here is no rocket science involved in it. It simply relays the inclusion various values. Those can be optimistic or pessimistic. 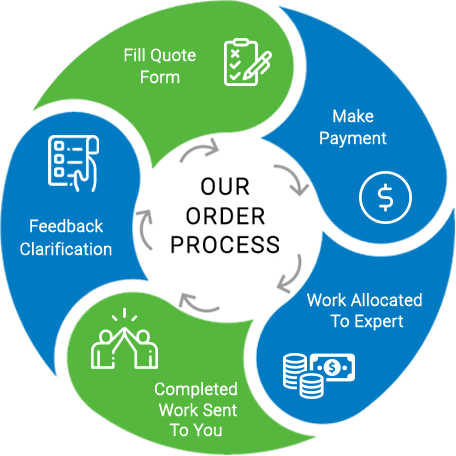 You will also have the understanding of project valuation in assumed price level and its impact in different situations. Again in the web chapter, you will come to the forefront of Monte Carlo simulation. This, in the general sense, is also called automated scenario analysis. With the help of this tool, you can describe nearly all possible future scenarios. On comparing both the tools, sensitivity analysis and scenario analysis, it is evident that both of them are same or almost similar. In case of sensitivity analysis, change can be seen in more than 1 input value. 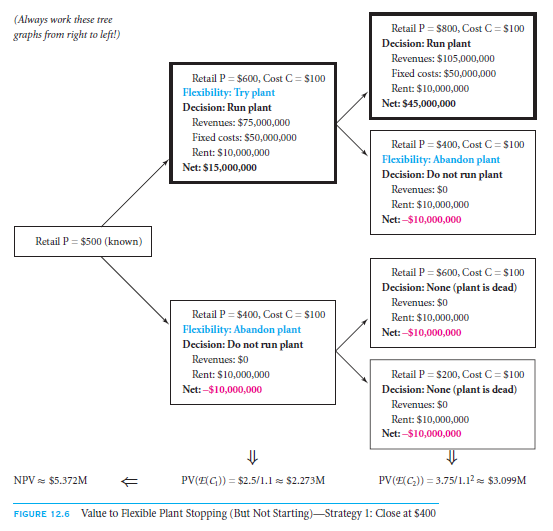 In case of scenario analysis, change can be seen in 1 input value.